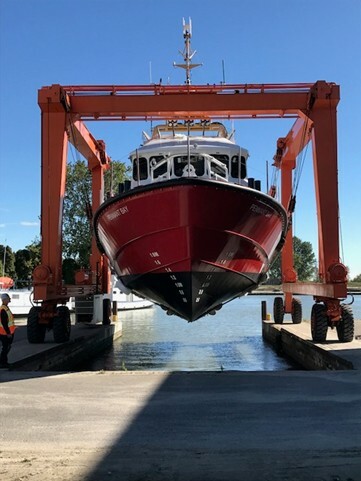 Canada is building twelve large, relatively fast, self-righting Motor Lifeboats. These are the “Bay” class and the first are now making an appearance. This again brings to mind the fact that at some point we will need to replace the four 52 foot MLBs and we may also want to use the replacement class in other areas where exceptional seakeeping and longer range than the 47 footers is desirable. We did discuss this possibility earlier including some other alternatives and got lots of comments. 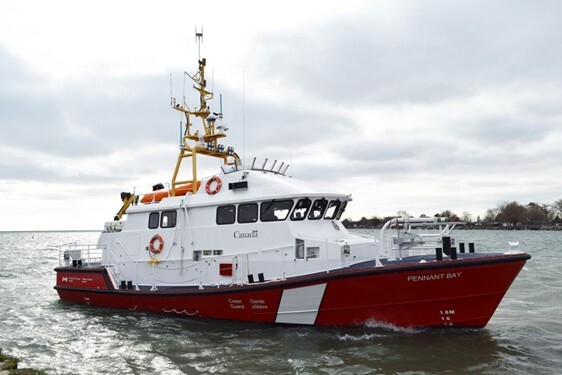 Chantier Naval Forillon and Hike Metal were awarded contracts totaling $89.2 million (Candian presumably, about $67.5M USD–Chuck} to build twelve of the new SAR lifeboats. These self-righting, 20-meter (65.6 ft–Chuck) boats are powered by a pair of MTU 1600 HP marine Diesel engines providing a speed of up to 24 knots in extreme weather conditions. These vessels are primarily a day boat and will be operated by a crew of up to five Coast Guard seamen. This entry was posted in Canada, MLB, SAR by Chuck Hill. Bookmark the permalink.